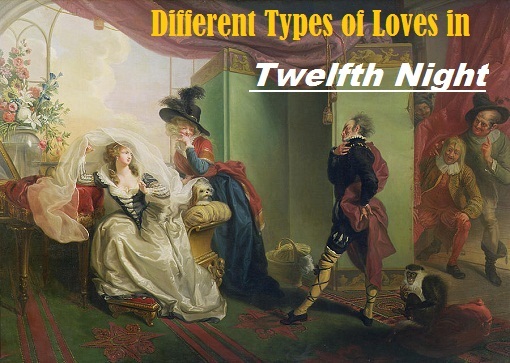 British Literature Broad Notes Plays Shakespearean Plays Different Types of Love in Shakespeare's "Twelfth Night" or Theme of Love in "Twelfth Night"
Different Types of Love in Shakespeare's "Twelfth Night" or Theme of Love in "Twelfth Night"
In Europe from the Christian times onwards the tradition of courtly love developed. This is tradition of idealized love. It held the view that love between a man and a woman could be purifying and ennobling. It could be spiritual as well as physical. The concept of courtly love affected the European literature and Shakespeare’s romantic comedy Twelfth Night had no escape from this contamination. “If music be the food of love, play on; Give me excess of it, that surfeiting, The appetite may sicken and die” (I.i.1-4). As Orsino continues to wax rhetorical and hysterical about being in love, it rapidly becomes apparent that he is playing a game with himself, which he will continue throughout the play. He is not in love, but in love with love. Olivia is unattainable and she has told him so repeatedly. Yet Orsino persists in making himself suffer, listening to sad love songs, writing to her, staying awake at night and crying into his pillow because he believes that this is the way someone in love acts. Viola has a real, deep love for the Duke. It is born of the heart and it is silent and ardent. It is passion not only of the senses but of intellect and the soul. Viola actually proves that women can have strong romantic love. She falls for someone she comes to know well, which she can only do because she's disguised as a man. But she also has better ideas than Orsino on how to woo Olivia, and only has to promise Olivia to "build me a willow cabin at your gate". Sebastian’s is natural but not full grown like that of Viola. His is also a love at first sight, and he does not stop to examine its depth. As well as the marriages of Olivia and Sebastian, Orsino and Viola, the play sees the wedding of Sir Toby and Maria, an odd couple who are nevertheless well suited. Their love seems more pragmatic: Sir Toby, it is reported, married Maria in "recompense" for her part in a trick, yet they are great friends throughout the play. Maria worries from the beginning about Toby's "quaffing and drinking". In the sub-plot, Malvolio is led to believe that Olivia, his mistress loves him. His loves for Olivia arises out of his self-love: it is fantasy, the product of his vanity and conceit. Here Shakespeare displays the follies of love. Both Olivia and Viola mourn the death of a brother in the play but Viola demonstrates a more practical approach, taking care of herself. Olivia over-dramatises her loss and therefore her love. This makes Orsino think Olivia will be even more passionate when it comes to being a lover; he thinks she will "pay this debt of love but to a brother". The friendship that Antonio shows to Sebastian is another kind of love in the play. Despite the fact that Antonio has enemies in Orsino's court, he follows Sebastian to see if he can help him, which results in his being arrested as a "notable pirate". This is the only really strong friendship in the play and serves to highlight the unusual aspects of Viola and Orsino's 'friendship'. Shakespeare broadens the canvas of the play by diversifying the theme of love. Viola, the heroine has sincerity and seriousness of love; her love is the measure by which the other loves are judged.